1730s ~ 1740s: son of Arashi Shichigorô I, his first stage name is Arashi Ryûzô I. He becomes disciple of Ichikawa Danzô III and receives the name of Ichikawa Ryûzô at an unknown date. 11th lunar month of 1746: Ryûzô becomes zamoto and produces at the Naka no Shibai the kaomise drama "Genji Musha Hinode Ôgi". 8th lunar month of 1748: the drama "Yoshitsune Senbon Zakura" is performed for the first time in Ôsaka, at the Naka no Shibai; it is produced by Ryûzô [casting]. 1753 ~ 1757: Ryûzô is on tour, performing in inaka shibai. 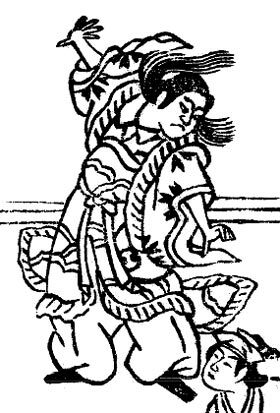 2nd lunar month of 1758: Ichikawa Ryûzô takes the name of Arashi Shichigorô II at the Kado no Shibai, playing the roles of Kaminari Shôkurô, the ghost of Kawazu Saburô and Kudô Saemon Suketsune in the drama "Okina Gusa Goshiki no Hanabusa". 1st lunar month of 1760: Shichigorô's rank in the Kyôto hyôbanki, katakiyaku section, is jô-jô-(shiro)hankichi (superior - superior - (white) half excellent). He shares the same rank with Matsumoto Tomojûrô II. 8th lunar month of 1764: Shichigorô plays at the Naka no Shibai the role of Yahei in the drama "Fumizuki Urami no Kiriko"; the roles of Otsuma and Hachirobê are played by Nakamura Kumetarô I and Mimasu Daigorô I. 9th lunar month of 1764: première in Ôsaka at the Naka no Shibai of "Hare Kosode Tsuzure no Nishiki", based on the puppet drama "Katakiuchi Tsuzure no Nishiki", which is produced by Mimasu Daigorô I. A similar play was staged one day before under a different title, "Oriawase Tsuzure no Nishiki", at the Kado no Shibai. The competition for the best performance and the best line-up is open between the 2 theaters. The performance at the Kado no Shibai is more successful than the one at the Naka no Shibai; Shichigorô plays at the Naka no Shibai the role of Sahei [casting]. 11th lunar month of 1768: Shichigorô plays in Ôsaka at the Kado no Shibai in the kaomise drama "Shin-yakata Banzei no Kotobuki", which is produced by Yamashita Yaozô I. 3rd lunar month of 1769: Shichigorô's rank in the Ôsaka hyôbanki, katakiyaku section, is jô-jô-(shiro)kichi (superior - superior - (white) excellent). 6th lunar month of 1770: Namiki Shôzô I's drama "Yadonashi Danshichi Shigure no Karakasa" is staged for the first time in Ôsaka ôshibai, at the Kado no Shibai; Shichigorô plays the role of Kyûshichi [casting]. Fall 1771: Shichigorô goes to Kyôto. 11th lunar month of 1771: Shichigorô plays in Kyôto at the Kitagawa no Shibai the role of Osaragi Daigaku in the kaomise drama "Miyako Yoshino Mikado no Takadono", which is produced by Mimasu Tokujirô I, welcomes in Kyôto the Edo actor Sakata Hangorô II and celebrates the shûmei of Sawamura Sôjûrô III, Anegawa Minato II and Yamatoyama Rinzaemon II. 11th lunar month of 1774: Shichigorô plays the role of Arao Gotôta in the kaomise program "Akanesasu Kogane no Maruyama", which is produced by Fujikawa Sango at Hayagumo Chôdayû and Hoteiya Umenojô theater. His stage partners are Onoe Kikugorô I, Arashi Hinasuke I, Sawamura Sôjûrô III, Onoe Matsusuke I (who arrives from Edo), Onoe Shinshichi I and Yoshizawa Iroha I. 12th lunar month of 1781: premiere in Ôsaka at the Kado no Shibai of Nagawa Kamesuke I's drama "Tengajaya-mura" [casting]. A similar play is staged a few days later under a different title, "Renga Chaya Homare no Bundai", at the Naka no Shibai. The competition for the best performance and the best line-up is open between the 2 theaters; Shichigorô plays at the Naka no Shibai the role of Sôma Saburôemon [casting]. 9th lunar month of 1783: the play "Igagoe Dôchû Sugoroku" is adapted for Kabuki for the first time, in Ôsaka at the Naka no Shibai; Shichigorô plays the roles of Sawai Matagorô, Matagorô's mother Narumi and Usami Goemon [casting]. 1st lunar month of 1784: premiere at the Naka no Shibai of Namiki Gohê's drama "Keisei Yamato Zôshi"; Shichigorô plays the roles of Momonoi Shuridayû, Hikaki and Daiba no Niza [casting]. 2nd lunar month of 1787: Shichigorô's name appears in a hyôbanki for the last time; his rank in the Kyôto hyôbanki, katakiyaku/jitsuaku section, is is two black strokes above jô-jô-(hanshiro)kichi [visual]. Spring 1788: he goes on tour in Sakai with Ichikawa Danzô IV and Mimasu Daigorô II. His last stage performance is most likely in the drama "Kanadehon Chûshingura", in which he plays the role of Kô no Moronô and Ono no Kudayû. He dies in the city of Mitajiri the 28th of the 5th lunar month of 1788. Arashi Shichigorô II was a talented actor, who was specialized in katakiyaku and jitsuaku roles and who made most of his career in Kamigata from the middle of the 1740s to the end of the 1780s. He was endowed with a powerful voice and his diction was outstanding. Arashi Shichigorô II performing in the 11th lunar month of 1782 at the Naka no Shibai in the kaomise drama "Zu ni Notta Bankoku Tokai"